Shall we? Well, we need to. We’re short of electricity. We have been for a long while. Things have been better recently, but that’s mainly due to the economic downturn rather than any huge increase in generating power. So, we need more electricity so that when things pick up again (lol! ), we are ready to go and there are no further instances of “rolling blackouts” or “loadshedding”. Much has been made of the SA Government’s insistence of going down the nuclear route. Currently, we have just one nuclear power station, just up the road at Koeberg. The alleged R1 trillion deal with Russia would add several more, and also the opportunity (so the cynics say, at least) for massive kickbacks, corruption and general naughtiness. The cynics may well be right. But their fears are not what this post is about. Brian Molefe, group chief executive of Eskom, allegedly recently stated that nuclear was “the cheapest option” and a local fact checking website went after him on that claim. They found, perhaps unsurprisingly, that his alleged claim was incorrect. But his inaccuracy is not what this post is about. And you can see that Brian was incorrect. Naughty Brian. Well done, Africa Check. Thankfully, one thing everyone can agree is correct is that South Africa needs to generate more electricity. Oh, and that we really can’t afford to pay any more for it. So, what exactly are our options? There’s hydroelectric. Clean, renewable, easy, cheap. It would be lovely to run our country with electricity from mountain streams and melting snow. But we don’t have mountains streams and melting snow. In fact, we have a few issues with the amount of water we have available for anything full stop. Put simply, there just isn’t enough water to make HEP a viable option. There’s coal. Coal is cheap, we have lots of coal and we have lots of big coal-fired power stations. But coal is filthy. It makes shedloads of greenhouse gases and a billion other pollutants that no-one wants. Greenpeace says no to coal, and it’s just about the only thing I agree with them on. Going forward, coal should not be on the table (or in the furnace) for generating electricity. Next up is gas. It’s there with wind and nuclear as a level levelised cost. Now, I happen to know that just under the Karoo is (conservatively estimating) about 450 000 000 000 000 cubic feet of shale gas. And I’d tap that gas. We could drop coal, drop our carbon emissions and make lovely, relatively clean, relatively cheap electricity. Except the green people aren’t happy with the plan to extract the shale gas. We’ve covered this… er… “extensively” on 6000 miles… I don’t think I need to go into again. Shale gas would be brilliant for SA. But the bunnyhuggers are determined that it won’t happen. There’s nuclear – right there. Reasonably cheap, very clean, super reliable. Look at Koeberg – running without any big problems since 1984. There may be issues about corruption, but whatever methods we choose, this is electricity generating infrastructure on a massive scale. Sadly, there will always be those opportunities. At 3MW per massive 145 metre (90m hub + 55m blade) turbine, you’d need 3,200 turbines! And that’s assuming 100% efficiency. Wind farms don’t do 100% efficiency. Wind farms only do about 30% efficiency (and I’m being nice here). So basically 10,000 turbines to guarantee that 9.6GW figure. If you’ve seen the blot on the landscape that is the Dassiesklip Wind Farm near Caledon, you’ll see how much of an eyesore just 9 (nine) turbines can be. And how much space they take up. To achieve the 9.6GW capacity planned for this nuclear thing, we’d need something about 33 times the size of the current largest solar park in the world. That would cover 32,043 hectares and would cost about $33 billion. So, no. Nuclear might not be the cheapest option for generating electricity in South Africa. And Brian Molefe shouldn’t be saying that it is. But until someone comes up with any other viable option – and I really don’t see anything reasonable on the table or anywhere close – it might well be the best option for electricity generation in South Africa. Petrol is going up again next month and people are understandably searching for alternatives. 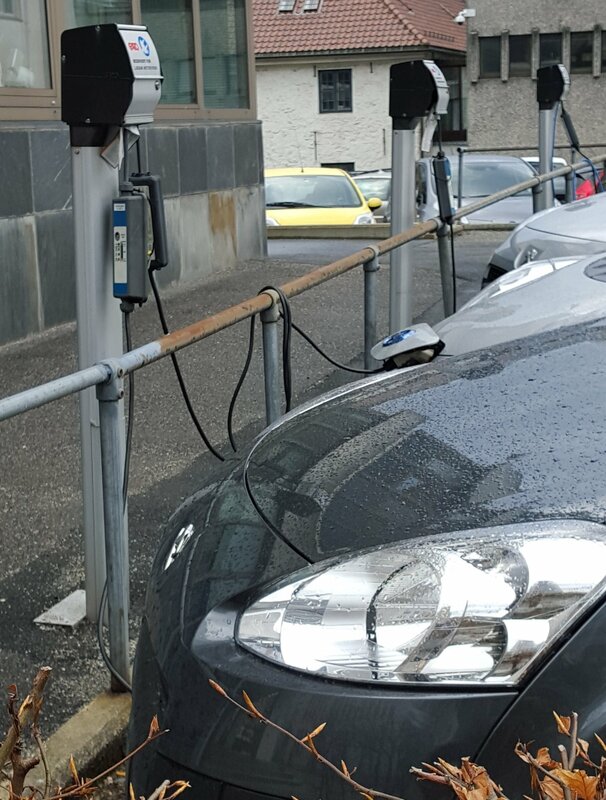 Norway, with a population of only five million, now has on its roads 35,000 electric vehicles (EVs), which also represent 14.5 per cent of new vehicle sales. Figures show another spike last month with 1,346 sales. Those benefits are incredibly generous, including exemption for VAT and car tax as well as access to bus lanes, free parking, free toll-road use, free ferries and employment tax benefits. A recent study suggested this equals as much as £1,000 a year in savings over the life of an EV. Never mind. A by-product of this apparent greed is fewer car fumes in the city. Winning all round. One drawback with electric cars, however, is that they require electricity to run. Bugger. But in Norway, this is fine, because almost all of their plentiful electricity comes from the plentiful water falling down the plentiful waterfalls on the side of the plentiful mountains. And that’s very clean and green. In South Africa, we don’t have enough water or big mountains to work this way. We do have shedloads of fossil fuels though, so we make our electricity by burning those. Thus, following the electrical supply audit trail upwards, when you plug in your EV in Cape Town (and good luck with finding somewhere to do that, by the way), it’s basically running on coal, like an old steam engine. Filthy. So, right now, there’s really no environmental benefit to driving an EV in South Africa. And they’re massively expensive. Massively, massively expensive. Like solar panels. But more so. Yes. Going down a hill “propelled by gravity” is environmentally neutral. Well done. But that vehicle taking you to the top of the runs? Fossil fuels, mate. And the laws of Conservation of Energy mean that the whole uphill thing will be especially dirty, heading up Kloof Nek and generating all that potential energy for you and your huge scooter. I suppose that the thing with electric cars is that you would need to measure the amount of damage that burning petrol is doing versus the coal to make the electricity for your EV. But that difference is likely to be minimal. There was the option of buying clean power by subsiding the 4 wind turbines near Darling, darling, but they proved to be so inefficient that the company went bust. Darling Wind Farm was one of the first two wind farms in South Africa. It is located 70 km (43mi) north of Cape Town, between Darling and Yzerfontein on the west coast of South Africa. It is an Department of Energy demonstrator site with the 4 turbines constructed. The second phase, 6 additional turbines, was never completed. Darling Wind Power company is subject to liquidation. The DWP Board adopted a resolution to liquidate the company. Expected to operate at 28% capacity and deliver 13.2 GWh per year, it has only been delivering 8 GWh per year at 19% capacity. OK. Once we get our clean electricity sorted (hello nuclear) and the price of cars with big batteries comes down to at least reasonable levels, we can revisit the electric car in South Africa. But these things aren’t going to happen before petrol goes up by a Rand per litre in a fortnight’s time. And so that’s why you need to try out our massively efficient public transport system [cue laughter] or start walking. One of the benefits of being over in the UK recently was that I was able to pick up the latest copy of Private Eye magazine. I used to be a subscriber, but found that the postal delay rendered much of the content dated and irrelevant. If ever there was a case for a publication having a digital edition, Private Eye are it. Topical satire simply doesn’t age well. WHEN the authorities make contingency plans against predictable disasters, we all applaud their foresight. Which catastrophes they are thinking about, however, can be revealing and give cause for concern; and right now the government is working on the possibility of a five-day nationwide power blackout – putting all its breezy denials of the lights going out into perspective. As frequently noted here, energy policy since the dreadful Energy Act 2008 has resulted in the safety margin between reliable electricity generating capacity and peak demand becoming progressively and dangerously tighter. A 20 percent margin would be considered comfortable; but this winter it will only be 1.2 percent – down from 4.1 percent last year – before the National Grid takes special short-term measures. The grid has recently been bolstering its emergency resources with banks of diesel generators and the right to switch off industrial customers. Publicly the government always insists “the lights will stay on” – in homes and hospitals, that is. But it’s a costly, third-world way to run a grid in a supposedly advanced economy: and now we know they obviously don’t think it is guaranteed to work. This would most probably happen in winter. It goes without saying that such a situation would also bring about ghastly accidents and loss of life, with the emergency services much constrained in their ability to cope. The implications for industry, commerce and public order are grim, too. If it’s any comfort, the German authorities – based on their own crazy energy policy – are looking at very similar scenarios. With all this at stake, as prudent as it may be to plan for potential calamities, it would surely have been better to render the blackout scenario redundant by properly ensuring security of electricity supply. The current combination of intermittent wind farms, ageing nukes, fast-closing coal-fired power stations and mothballed gas-fired plants doesn’t do that: and privately the government knows it. When similar ‘disaster’ plans made by Eskom and the SA Government became public knowledge, there was considerable disquiet and some small degree of panic (probably mainly thanks to scaremongering headlines). Sales of tinned goods reached heights not seen since 1994 and we all waiting to be plunged into dark, apocalyptic anarchy. The cost of this SA/Ruskie venture? A tidy One Trillion Rands. It’s a lot of money, but the issues are not specifically around the cost, but (as you will read here) mainly around the safety of nuclear power stations and the potential for widespread corruption. Thing is though, the safety issue isn’t actually an issue – one only has to look at the still completely unexploded Koeberg Power Station to see that. And the corruption thing, while entirely valid, has got very little to do with this specific deal, and would be a problem no matter what large scale civil engineering project was being undertaken, and by whomever. That’s how these things work in SA. It’s sad, but it’s true. So your plans for a ‘super clean’, ridiculously big, massively inefficient solar plant would attract the same problem. Your unpretty, flying thing killing, massively inefficient wind turbine plan will also be loaded with backhanders. But Greenpeace will probably choose to ignore that. Large scale projects are expensive. 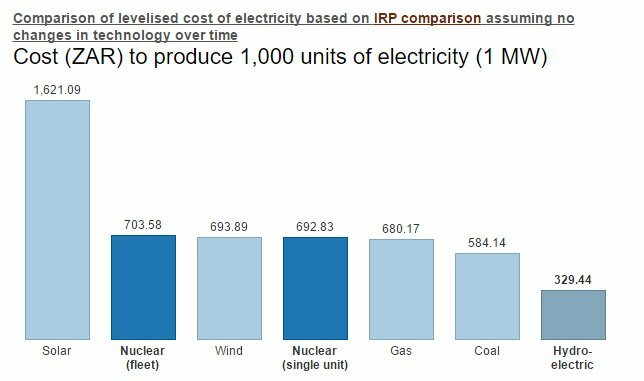 Producing electricity is expensive. It’s something we have to accept though, because these are things that we need. People with trendy, fleetingly zeitgeist ideas like diverting that Trillion Rand to tertiary education are missing the rather obvious point that without some form of generating more electricity, there will be nothing for their newly graduated thousands to do in an economy that’s lying in small bits and pieces all over the bottom of Africa. Yes, of course this situation could definitely have been better managed – it could still be better managed – but we need to do something, because otherwise we’re going to end up implementing that Eskom blackout plan. And that is not a road we want to be going down. PDF of the Private Eye article.